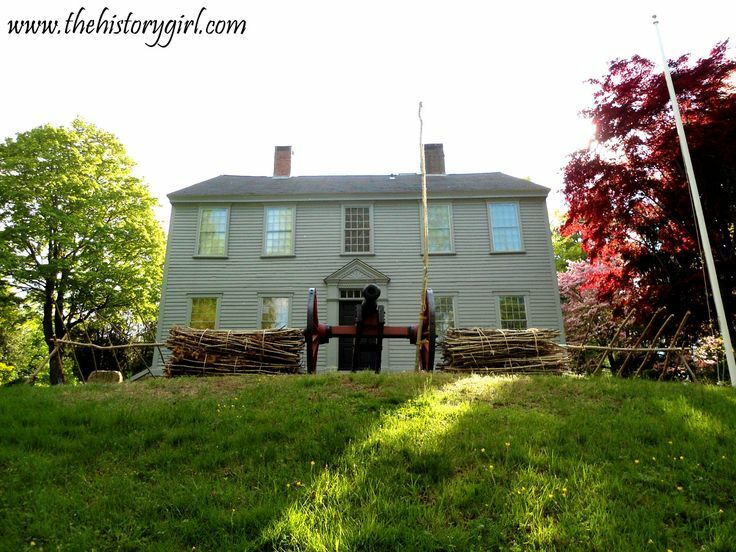 Nathanael Greene's Rhode Island Homestead ~ The History Girl! Situated on a hill, with what was once a commanding view of the the Pawtuxet River, is the Nathanael Greene Homestead in Coventry, Rhode Island. Although nature has reclaimed the view of the river, this 1770s homestead was saved in 1919 to serve as a museum and is an excellent example of the early preservation movement in the United States. For almost one hundred years, the Nathanael Greene Homestead Association has maintained the building and the property. The meadows that surround the building are being cleared once again by volunteers, a sign that possibly one day soon, a view of the river will be seen once again. Nathanael Greene was born at the Forge and Grist Mill in Potowomut, Warwick, Rhode Island in 1742. His father, Nathanael Sr., was a Quaker minister. Nathanael Jr. received a traditional Quaker education in reading, writing, and simple math. He was trained in the family business as an ironmaster. The family forge was very successful and prompted the establishment of a second forge in Coventry, about ten miles away. By 1768, over one hundred families lived in the area surrounding present-day Coventry, which had become known as 'Greenville.' In 1770, Nathanael moved to 'Greenville' to oversee the forge and built a home for himself near it. The home and forge, which featured a trip hammer forge, covered eighty-three acres. In 1772, tragedy struck the site and a fire decimated the forge. The forge was rebuilt, but it did not survive into the nineteenth century. The Georgian style home that Nathanael built was simple in design, reflective of his Quaker upbringings. The home is two-and-one-half stories tall and five bays wide. It is set on a foundation of random, sandy-brown granite ashlar. The exterior lacks ornamentation, but Nathanael's prosperity was demonstrated in the Greek-revival entrance, topped by a rectangular transom, flanked by fluted pilasters, and topped with a triangular pediment with dentils and a fan motif. This elaborate doorway draws the visitor's eyes to the main entrance. Each floor contains four rooms, two on each side, separated by a wide center hall. Each room has a paneled fireplace, connected to two large central internal chimneys. It has not been proven, but historians speculate that the hardware throughout the home may have been forged at the Greene family iron works. The home was originally called "Spell Hall," as indicated in one of Nathanael's letters. It is believed that one of the rooms in the home served as a classroom for the local children. Nathanael had a fondness for reading and had over three hundred volumes in his personal library. Nathanael married Catherine Littlefield on July 20, 1774 at her uncle's mansion in Warwick, Rhode Island. Catherine, or Caty, as she was called by most, was born on February 17, 1755, to John and Phoebe Littlefield on the island of New Shoreham, now known as Block Island. Catherine's mother died in 1765, when she was only ten years old. Her father realized that Catharine was of the age when a woman's influence was absolutely necessary, so he sent her to live with his late wife's sister, for whom she was named, Catherine Ray and her husband, William Greene, in East Greenwich, Rhode Island. William Greene was the third cousin of Nathanael. Together, Nathanael and Catherine had five children. Their first child, a son, was named George Washington Greene. In 1777, they had their first daughter and named her Martha Washington Greene. The Greene's held George and Martha Washington in high regard. Their other three children were Cornelia, Nathanael Ray, and Louisa Catharine. All five children were born during the Revolutionary War. Nathanael's military and political life began in 1770 when he served as deputy to the Rhode Island General Assembly. He served in that position until 1772 and again in 1775. In October 1774, he helped to organize a militia company, known as the Kentish Guards. But due to a stiff knee that he developed during childhood, his fellow militiamen refused to allow him to act as an officer. After the first shots of the Revolution were fired in Lexington, Greene hurried to Boston. On June 22, 1775 Greene was made a brigadier general in the Continental Army. Quickly befriending General George Washington, he was placed in charge of the defenses of Brooklyn and on August 9, 1776 Greene was promoted to major-general in the Continental Army. Nathanael Greene Homestead, circa 1902. Greene became one of Washington's key advisers. He was present at the Battle of Trenton, New Jersey, on Christmas Eve, 1776, when he led the left column. On January 3, 1777 he again led the left column at the battle of Princeton and spent the winter of 1776-1777 at Morristown. In November 1777, after the fall of Fort Mifflin, Greene was sent to defend Fort Mercer, New Jersey, on the Delaware River, but he wisely evacuated the fort as powerful British forces started to encircle the garrison. During the winter of 1777-1778 at Valley Forge, Greene was appointed to Quartermaster General by General George Washington. As quartermaster, his responsibilities included getting supplies to the army and organizing the army's camps. When he accepted the position, he reserved the right to also continue as a commanding general in the field. He used that right on June 28, 1778, at the Battle of Monmouth, when he assumed Line command after General Washington summarily ordered General Charles Lee from the field. Greene took over Lee's command for the day. On June 23, 1780, Washington briefly allowed Greene to command troops in the battle of Springfield, New Jersey. In the south, the Continental Army under the command of Horatio Gates fell to the British. On October 5, 1780, Washington chose Greene as Gates' replacement to lead the army south of Delaware. Greene essentially became the second-in-command of the entire Continental Army. In the south, Greene would divide his meager army and retreat throughout North Carolina, dividing the Redcoats and essentially exhausting them. Green's greatest achievement was his race to the Dan River, where he took all the boats across, leaving the British stranded on the other side. Although Cornwallis surrendered in 1781, the resilient yet exhausted British troops would not withdraw from the South until December, 1782. 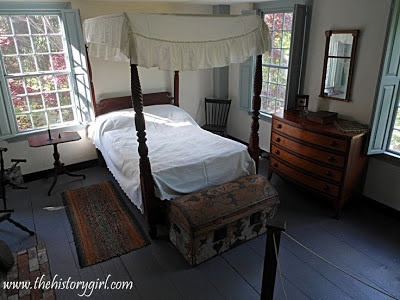 A late eighteenth/early nineteenth century bedroom at the Nathanael Greene Homestead. When Greene rode northward in 1783, he was greeted everywhere as a hero and he found himself as famous in the North as in the South. He met Washington at Trenton and together in October they visited the Continental Congress at Princeton. From Congress, Greene received permission to return home to Coventry, Rhode Island, and he resigned from the Continental Army on November 3, 1783. That same year, General Greene's family moved from Coventry to Newport for a brief time and then to Mulberry Grove, Savannah, Georgia. The State of Georgia gave him a plantation on Cumberland Island as gratitude for his service. Greene sold his Coventry home to his brother, Jacob Greene and his wife Peggy, in 1783 and the structure remained in the Greene family for two more generations until 1899. Sometime in the mid to late-nineteenth century, a rear ell was constructed on the home and in the 1870s, the front door area was Victorianized with a bracketed hood and double window door. Upon the death of Elizabeth Margaret in 1899, the property was inherited by the children of her first marriage, Patience and Harris Inman. In 1915, the home was sold out of the family. For a brief period, the house was used an an apartment house and began to deteriorate. Showing great concern for the property, four members of the Kent County Chapter of the Rhode Island Sons of the American Revolution purchased the property in 1919. The interior was restored in the early 1920s, shortly after the Nathanael Greene Homestead Association's purchase of the home. The first caretaker of the property actually lived in the house's rear ell, but by 1935, a caretaker's cottage was built on the property and is still occupied. A view of the Greene Cemetery, 1914. A second interior restoration was completed in 1990, which included a paint and wallpaper analysis. This analysis finally allowed historians to interpret the original colors and wallpapers used throughout the homestead's history. All but one of the rooms on the second floor have been decorated as they would have appeared in the late eighteenth and early nineteenth centuries. One bedroom has been decorated in the Victorian style with wallpaper and lace curtains to interpret the building's last live-in owner, Elizabeth Margaret, who lived at the site until 1899. The Nathanael Greene Homestead was declared a National Historic Landmark in 1972. A short distance from the house, near the river, is the Greene family cemetery. 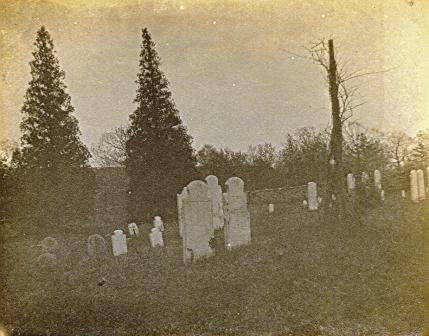 The cemetery was established as early as 1786 when Miss Margaret Greene, daughter of Jacob (brother of Nathanael Greene) and Margaret Greene passed away. Twelve identified burials have been recorded, in addition to four field stone graves identified from an 1859 Providence Journal article as being Revolutionary War soldiers who were being nursed for smallpox at the homestead and perished during their stay. 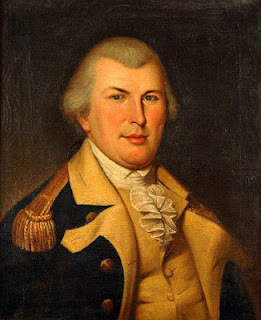 General Nathanael Greene and his wife are buried at Savannah and Cumberland Island, Georgia, respectively. Over the past few years, the cemetery and surrounding meadows have been cleared of the brush and trees that blocked its view from the homestead. Thanks to a dedicated core of volunteers, carrying on in the same spirit as the original founders of the Association in 1919, the Nathanael Greene Homestead stands as a preserved piece of Revolutionary history.